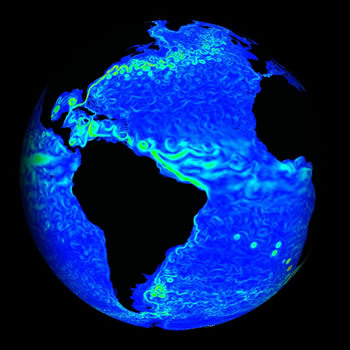 In this visualization, a model created by NASA, the color variations denote the speed of ocean currents. The lighter green areas are moving faster than the blue areas. Ocean currents are typically driven by surface wind and can have a huge impact on climate. In this image the Gulf Stream is clearly visible, as are eddies forming along coastlines and around islands. For more information and an animation of this image, see the NOAA web page (http://sos.noaa.gov/datasets/Ocean/seacurrents.html). Image courtesy of NASA. This workshop has already taken place. You can watch videos of the sessions and view the teaching activities created at this workshop. The workshop will be held online and will use web conferencing, web collaboration tools, online discussions, and conference calls. Workshop activities will be a blend of synchronous sessions and asynchronous work time. This workshop is a follow-on from a 2011 workshop. The workshop is free of charge, but space is limited and pre-registration is required by April 11, 2012. For more information, contact Karin Kirk (kkirk at carleton.edu).